An image showcasing the Galaxy S10 suggests that the company might announce the phone in a Cinnabar Red colour model. 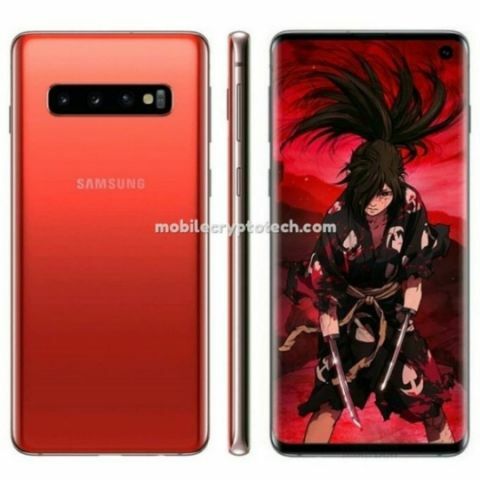 Samsung Galaxy S10 spotted in new Cinnabar Red colour variant. The smartphone might be a limited edition variant. Samsung will be announcing its Galaxy S10 series of smartphones at its upcoming Galaxy Unpacked event on February 20. However, ahead of the official announcement, numerous leaks regarding the device have surfaced online. The company is expected to announce a Galaxy S10 Lite, a standard Galaxy S10 and a Galaxy S10 Plus smartphone this year. Out of the three, the Galaxy S10 Lite, which is also being called the S10e, is speculated to be the iPhone XR competitor and it could also be launched in multiple colour variants. The Galaxy S10e was previously reported to be launched in a Canary Yellow colour variant and now, a new report by Mobile Crypto Tech, via GSMArena, suggests that the standard Galaxy S10 could also be announced in a Cinnabar Red colour model. As per the report, the new image comes from China and as one can observe, features an anime character as the wallpaper. It is speculated that this could be a special edition of the phone that might not be announced at launch but sometime later as the company has a tendency to announce new colour models of the phone later. This new Cinnabar Red colour variant might also be a limited edition model of some kind that might be made available only in specific regions. Speaking of leaks, a recent report tipped that the Galaxy S10+ could be announced with 1TB storage and 12GB RAM. According to an Early Pre-order page on Samsung Philippines, this special variant could be made available on March 15 in the country. This could very well turn out to be true as the company announced that it is mass producing the “industry’s first one-terabyte (TB) embedded Universal Flash Storage (eUFS) 2.1, for use in next-generation mobile applications”. The Samsung Galaxy S10 smartphones are expected to be powered by the Snapdragon 855/Exynos 9820 processor and might be launched in several variants. The Galaxy S10e could feature a 5.8-inch 2K Super AMOLED display, while the Galaxy S10 could be equipped with a 6.1-inch 2K Super AMOLED display and the Galaxy S10+ is reported to feature a 2K Super AMOLED display. The Galaxy S10e is speculated to have the fingerprint sensor embedded in the power button while the other two variants are said to sport an in-display fingerprint sensor. In terms of pricing, the Galaxy S10e could be priced at 749 euros (approx Rs 61,000). Galaxy S10 may be priced at 899 euros (approx Rs 73,000) for the 6GB + 128GB variant and 1149 euros (approx Rs 94,000) for the 8GB + 512GB configuration. The same storage variants are expected to fetch 1049 euros (approx Rs 85,000) and 1299 euros (approx Rs 1.06 lakh) respectively for the Galaxy S10+. To buy the highest-spec model of the lineup, the S10 Plus with 12GB of RAM and 1TB of storage, users may have to shell out 1599 euros (approx 1.30 lakh).